The GroinBar's sensors are precision force transducers, designed for taking accurate measurements at high levels of force. However, like all precision instruments, they must be used correctly in order to ensure accuracy and prevent damage. This article gives an overview of how the GroinBar's sensors work, and how to ensure you get the best out of them every time. 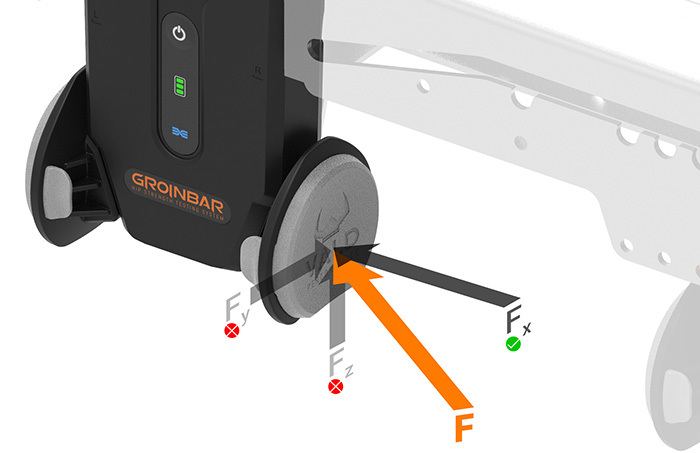 The GroinBar's sensors are "uniaxial", meaning they are designed to read forces perpendicular with their Force Pads. 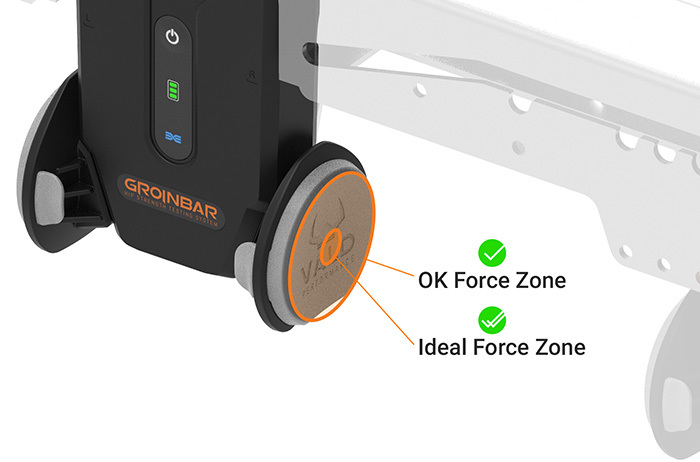 The GroinBar can read force accurately from any point on its Force Pads (see OK Force Zone below), meaning that alignment doesn't need to be perfect. However, exposure to inconsistent force placement over time can shorten the lifespan of the GroinBar's sensors. Furthermore, inconsistent limb placement can reduce comfort during testing. For these reasons, it is recommended that the limb/body part exerting force is centred in the Ideal Force Zone (see below) wherever possible. While force can be exerted essentially anywhere on the Force Pad, if the force isn't perpendicular with the Force Pad, the sensor will only read part of the total force (i.e. the vector which is perpendicular with the Force Pad). For this reason, it is important to ensure that the force is exerted as perpendicular with the Force Pad as possible. Of course, this is not possible in some positions, but don't worry - as long as force is applied in the same direction consistently, your results will still be consistent. It is important to ensure that the GroinBar's sensors are "zeroed" before conducting a test (also known as "taring"), otherwise results can be inaccurate. 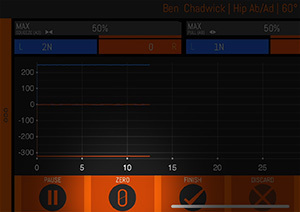 The GroinBar zeroes itself during startup, so when pressing the Power button, ensure that nothing is touching the Force Pads. 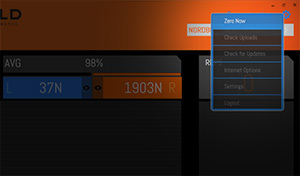 If the GroinBar's sensors are not zeroed correctly, you may notice that one force trace registers significantly above 0 N or below 0 N when no force is being applied to it. 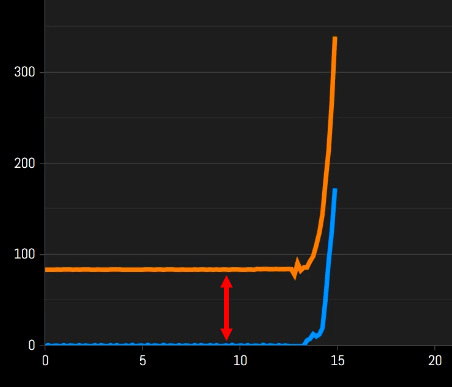 This may be indicative of a Positive Offset (above 0 N) or a Negative Offset (below 0 N). If you notice what appears to be a Negative Offset or Positive Offset, zero the sensors before running any more tests.